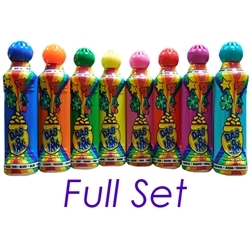 With this purchase you will receive a rainbow of one of each color of 1.5oz Dab-O-Ink, that's eight total daubers! Let's not forget the discount you get with this purchase when compared to a single dauber! This dauber has the 15mm tip and is perfect for the smaller cards. The daubers are 1.5oz or 43ml in size. The same great quality since 1962, that's right Dab-O-Ink is that good.